It's against this background that gold traded in a $20 range between $1250 and $1270 until Thursday, when gold was finally sold down to the $1240 level and silver to $19.10. At the same time the US dollar rallied strongly, being the West's preferred safe-haven from emerging market currency volatility. This is now the developing story, which may turn out to be the mainspring behind the gold price in the coming months. The big question is how will currency instability in emerging market economies affect demand for gold? Downward pressure, which has been brought on by the Fed's tapering policy, is forcing some Asian governments to increase interest rates. However, this at best is a short-term fix whose cost is less economic growth in the future. Particularly vulnerable are currencies whose central banks have limited quantities of dollars to hand, and while this excludes China, other gold-hungry Asian states such as India and Turkey are particularly vulnerable. Traders in Western capital markets would probably conclude this is a reason to sell gold because of deflation in Asia, while the Oriental would see additional gold as the best protection you can have from the currency debasement that governments always rely upon in times of stress. Looking beyond the rate hikes and the negative economic effects on emerging markets, we should be aware of the possibility that further selling of these currencies could accelerate. If so, we may have a replay of the East Asia crisis of 1997-98 on our hands with the addition of India, Turkey and half of Latin America. The Fed is pre-occupied with domestic monetary policy, and for the moment it seems international monetary co-operation is secondary. But undermining emerging markets, which make up nearly half global GDP, is not ultimately in the interests of America's own economy. Given the sharp reaction in foreign exchange markets, it seems reasonable for the Fed to pause its tapering programme to give these emerging economies a chance to stabilise. Någon tar ut guld från JPM valv. Another historical record withdrawal, JP Morgan had an additional 321,500 oz gold ounces removed from its vaults today. 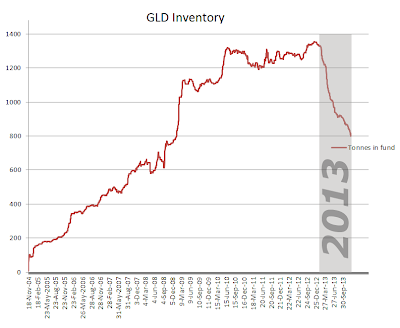 Since last Thursday, JP Morgan has lost 44% (20 metric tons = 643,000 oz) of its gold inventories. Academic research has shown that a public and private debt to GDP ratio above the range of 260-275% has a depressing impact on economic growth. In 2000 the U.S. debt level exceeded this range. Since then, the bond yield has averaged 4.6%, with inflation 2.1% and the real yield 2.5%. By comparing growth and debt figures prior to 2000 with those afterward, the magnitude of the problem and likelihood of its persistence can be assessed. From 1871 to 1999, private and public debt averaged less than 165% of GDP (well below the 260-275% critical level), and the trend growth in real GDP was 3.8%. From 2000 through 2013, growth has faltered to just 1.9%. Based on the latest 2013 figures, total private and public debt amounted to $58.2 trillion or 344% of GDP (Chart 3). If the debt to GDP ratio were currently the same as the average from 1871 to 1999, total debt should only amount to $30.5 trillion, or almost half of the existing level. The debt to GDP ratio declined since pea king in 2009 but not sufficiently to re-enter the normal range. 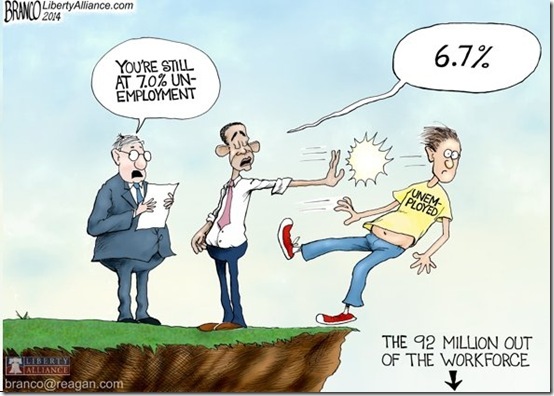 Moreover, the ratio resumed its upward trend in 2013. Thus, the U.S. appears to be following the Japanese example of trying to cure an indebtedness problem by accumulating more debt. Alla går i cykler, dags för nästa pil nedåt. Notera att pilarna tenderar att bli svarta pisten. Rubeln sviktar, ned nästan 10% på en månad mot dollarn. The Russian central bank vowed “unlimited” intervention to defend the rouble after it fell to a record low against a basket of currencies. 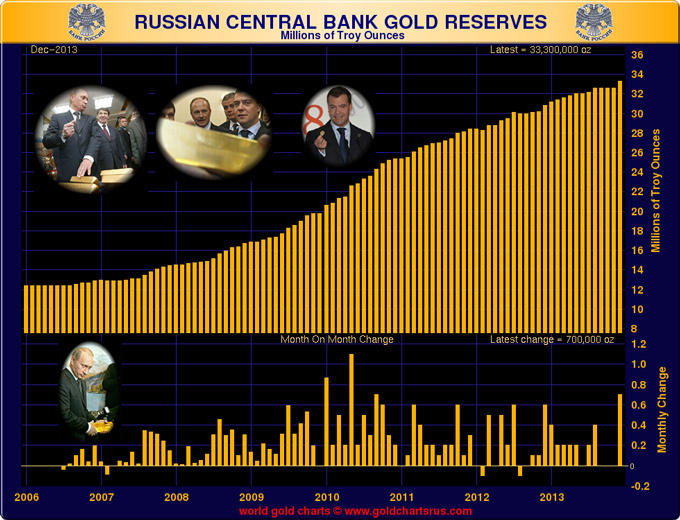 Moscow has already burned through $7bn of reserves since early January. Yields on Russia’s two-year “cross-currency swaps” – closely watched by traders for signs of a liquidity crunch – rocketed by 60 basis on Thursday to 7.6pc. They have risen by 140 points in the past three week. The International Monetary Fund said it in its annual health check that Russia’s growth potential has collapsed, exhorting the country to reinvent itself to escape the middle income trap. 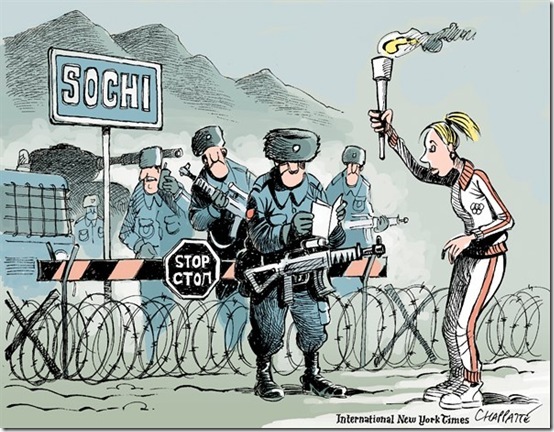 “Russia needs to embrace a new growth model. The previous model of high growth on the back of rising oil prices cannot be replicated,” it said. The emerging markets are now at a critical juncture. There have been record redemptions this month from mutual funds that invest in these countries but big insurance companies and sovereign wealth funds have held firm. The debt ceiling drama is back on. What it also means is that like every other time, the only question is just how creatively will John Boehner fold once more to every demand by an administration whose approval rating is on part with that of Dubya, all the while pretending to be fiscally conserative. Två likadana megafoner. Guldet är på väg uppåt. We now know that back then the Dow was trading in a secular bear market -- a broadening wedge with slightly higher highs and lower lows -- which started in the mid-to-late 1960s, and only came to an end in the early 1980s. Som januari går blir resten av börsåret. Kan guldbolagen leda guldet uppåt. Keep an eye on the gold stocks as they’ve been leading the metals and have a tendency to rebound substantially from important bottoms. The chart below shows that GDX is facing a confluence of trendline resistance here at $24. If GDX breaks to the upside then there is no major resistance until $30. That is another potential 25% upside. 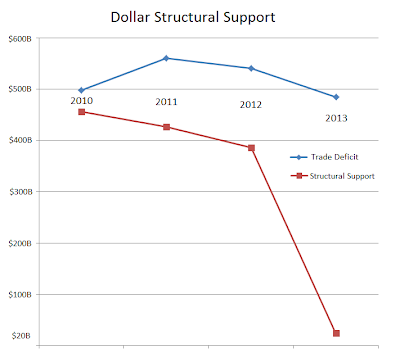 Your stop-out point could be support at $22. IMF är orolig för deflation. The International Monetary Fund is warning that the risk of a deflationary ’sudden stop’ for the global economy is as high as 20 per cent as the Federal Reserve continues to wind down its QE money printing by $10 billion a month until it stops completely in October. Interest rates in the emerging markets are the first casualty of Fed tapering as the central banks act to support their devaluing currencies. Turkey doubled its repurchase rate to 10 per cent this week. South Africa and India also hiked interest rates, and Brazil and Indonesia have already done so. China is the 600-pound gorilla at this party with its $24 trillion credit bubble larger than the banking systems of the US and Japan combined. Last year China staved off recession by spending $5 trillion on new plant and equipment, more than the US and Europe put together. Now the latest PMI data shows that the Chinese economy is in contraction. We know such financial bubbles only end one way. No country in history has managed it without a massive crash. And China has been there many times before in its long history that included the invention of paper money. 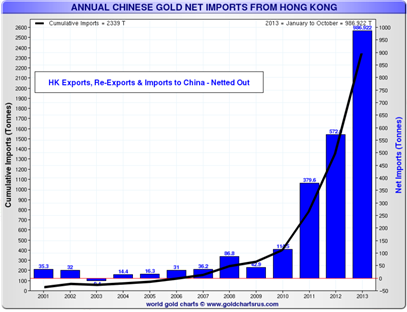 Last year China swapped paper for gold as fast as it could (click here). Could this prove to be the ‘ultimate deflationary shock’ and outshadow the Asian Financial Crisis of 1998 as Albert Edwards of Societe Generale predicts? Certainly the Abenomics of Japan have added fuel to this fire with the devaluation of the yen, something that is already unravelling as the yen becomes a safe haven. 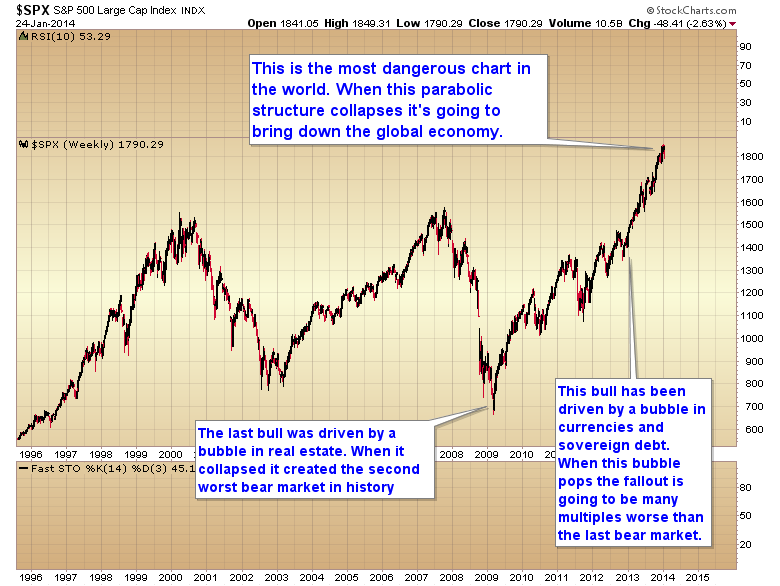 The US and Western financial markets will hardly be immune from this contagion. There will be a huge upset in global trade and severe deflationary pressure on industrial commodities. Look at the collapsing Baltic Dry Index this month. That’s already hitting the currencies of Australia and Canada but it has the potential to drag these economies into a slump too. Multinational profits will feel the heat. It will not only be Apple that struggles to sell iPhones in China. German car manufacturers are heavily dependent on China as a key export market. The reality is, look, silver is volatile. Silver is much more volatile than gold. And, I think the correct approach to any market is to understand that market. I feel I have a pretty good feel for the silver market, and I’m sure several would agree and probably some that would disagree. Regardless, I said look, the best way to do well in this market is, and this is from my personal take, to know ahead of time what’s going to take place and never miss a trade. That’s impossible. That’s not realistic. Is to look at when it’s overvalued and that type of thing to sell a portion of it and hedge your bets kind of thing. So, that’s the approach that I’ve taken all the way through this market. The only regret I might say is when I did get out at the top in the end of April 2011 I didn’t keep rolling that over again and again and again as I probably could have. 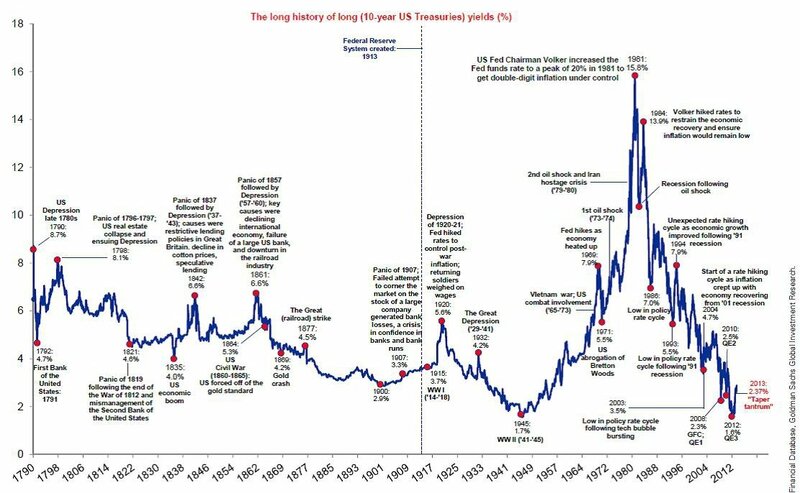 But, what’s done is done.Reality is fundamentally it’s actually never been better to get into the gold and silver market as it is right now. Stock prices will continue to go higher as long as the Fed and other central banks arepumping out money. It is a bubble. It will end badly. People will find that this crashes, 30 – 40 per cent in the matter of weeks, maybe even less. But, in the time being I expect stock prices will go higher, but not for the right reasons. The euro climbed 55 kopecks to 48.02 rubles on Wednesday evening in Moscow, the ruble’s weakest showing against the European currency since trading began. 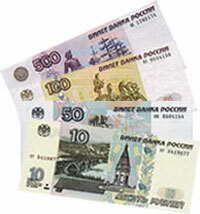 The dollar rose 47 kopecks to 35.20 rubles by the same time, the ruble’s lowest value against the greenback since 2008. If the ruble continues to weaken it will result in more expensive imports and could boost inflation, Russian Economic Development Minister Alexei Ulyukayev warned during a Cabinet meeting Wednesday, Prime business news agency reported. Other emerging market currencies are falling alongside the ruble as the United States winds up giant money printing programs that have buoyed emerging markets, but the ruble’s dive has been among the most pronounced. Tillväxten för konsumtionen avtar stadigt. Den privata konsumtionens tillväxttakt avtar och är nästan nere på nivåer som vi hade innan börsen vände upp under våren 2009. Då den privata konsumtionen står för merparten av tillväxten i den amerikanska ekonomin så verkar det som om FED minskar sina stimulanser i en nedåtgående ekonomi. Det är nog bara en tidsfråga innan FED måste ändra inställning och öka sina stimulanser då den stundande deflationen är dess värsta fiende. * Monetary inflation is the result of a parabolically rising monetary base (M0) driven by the central bank monetary easing policy. 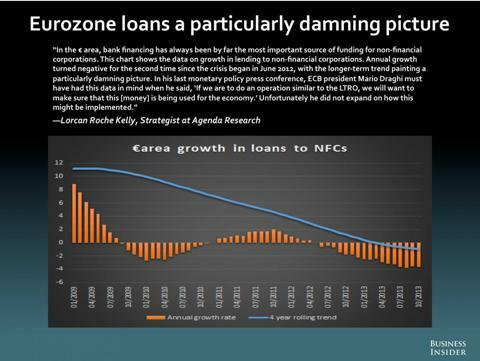 * Monetary deflation is the result of shrinking monetary aggregates M2 and M3 because of credit deleveraging. The following chart clearly shows that 2013 was a pivot year in which the monetary base M0 grew exponentially, while net M2 (expressed on the chart line as M2 minus M0) declined significantly. 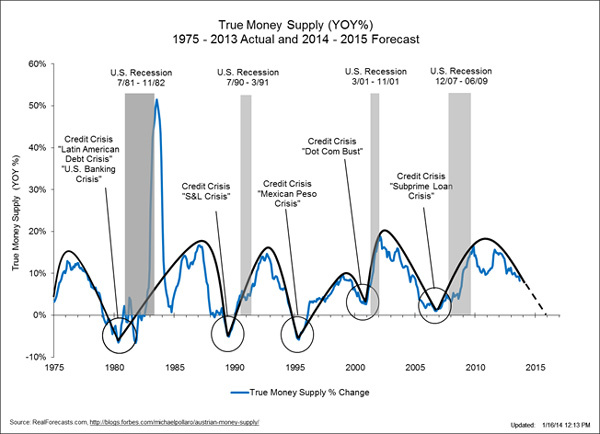 Additionally, money supply growth in the US and the Eurozone is trending lower. We expect that the ECB and later on the Federal Reserve will have to take aggressive actions to counteract this deflationary pressure. Från Ted Butlers blogg, köp silver. 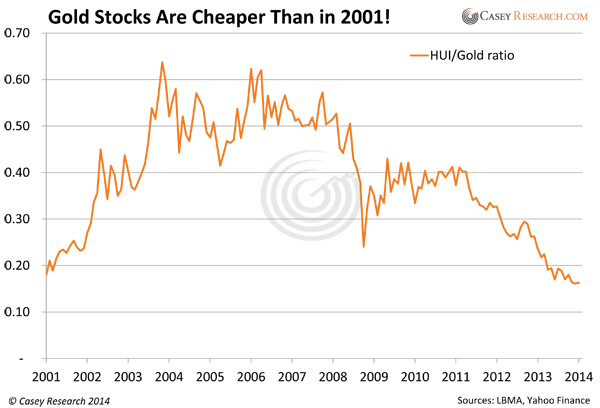 The current price for silver is extremely low and during the third quarter of 2013, silver mining costs averaged $21.39 per ounce. If these low prices persist, mines will eventually close reducing the amount of silver on the market. In turn, that lack of supply should push prices up. Perhaps of more significance is the level of demand. China and India, are importing increasing amounts of silver. Demand for physical silver into India increased dramatically throughout 2013, leaving market participants wondering if the country would import more than the record 5,048 metric tons of silver it brought in back in 2008. Recently, Bloomberg reported that Turkey imported 41.6 metric tons (MT) of silver in December, the largest amount since at least 1999. That brought the total amount silver imported by the country in 2013 up to 227.8 MT, a 60% increase from 2012 and much higher than the 42.1 MT Turkey imported in 2011. Meanwhile, while there has been a drain of gold from the Western ETFs and Funds, this is in sharp contrast to silver, which has had about 992 net tons added. 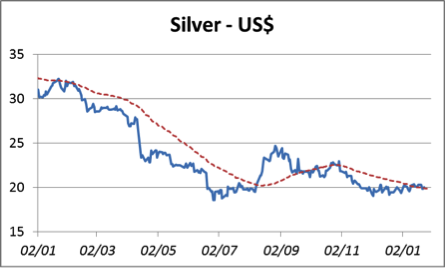 And, the demand for silver bullion coins especially the US Eagle has set new records. While on a percentage basis silver has had a worse price performance last year compared to gold, there has not been any panic selling at all. On the contrary, there has been a substantial increase in demand. 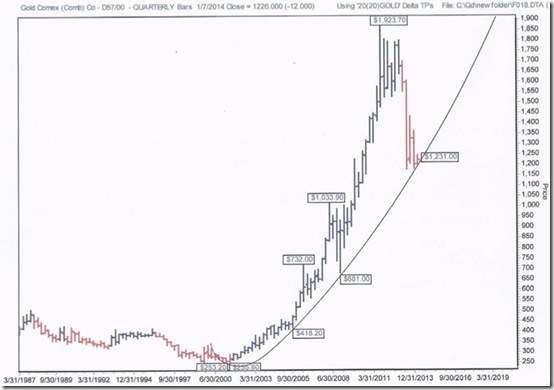 It is clear that the silver and gold market is being manipulated by some big players. But, all manipulations end, eventually. Ultimately, the price of silver is headed much higher, and so, take advantage of the current low levels. Vad skall dom hitta på vid nästa nedgång, kanske ett nytt monetärt system. Vi har nu uppnått den genomsnittliga längden på uppgång. on stimulation prematurely would be the most serious mistake that can be made economically. 1930 recovery had solid legs. Undrar hur dom har byggt i Turkiet. Vad händer i bank världen. It would appear the fears of a global bank run are spreading. From HSBC’s limiting large cash withdrawals (for your own good) to Lloyds ATMs going down, Bloomberg reports that ‘My Bank’ – one of Russia’s top 200 lenders by assets – has introduced a complete ban on cash withdrawals until next week. While the Ruble has been losing ground rapidly recently, we suspect few have been expecting bank runs in Russia. Russia sovereign CDS had recently weakned to 4-month wides at 192bps. A former Deutsche Bank executive has been found dead at a house in London, it emerged today.The body of William ‘Bill’ Broeksmit, 58, was discovered at his home in South Kensington on Sunday shortly after midday by police, who had been called to reports of a man found hanging at a house.Mr Broeksmit – who retired last February – was a former senior manager with close ties to co-chief executive Anshu Jain. Metropolitan Police officers said his death was declared as non-suspicious. 1. Due to the system maintenance of People’s Bank of China, Domestic RMB Fund Transfer through Citibank (China) Online and Citi will be delayed during January 30th 2014, 16:00pm to February 2nd 2014, 18:30pm. As to the fund availability at the receiving bank, it depends on the processing requirements and turnaround time of the receiving bank. We apologize for any inconvenience caused. 2. During Spring Festival, Foreign Currency Transfer Transaction through Citibank (China) Online and Citi Mobile will be temporally not available from January 30, 2014 18:00pm to February 7, 2014 09:00am. We apologize for any inconvenience caused. Är det här konjunkturutvecklingen i USA. Var är den berömda återhämtningen i USAs ekonomi. Turkiet höjer räntan för att rädda valutan. TURKEY'S CENTRAL BANK RAISES OVERNIGHT LENDING RATE TO 12.00% - this is the key rate, and it was at 7.75% until now, so an epic 4.25% increase, far greater than the 2.50% expected. I december började FED med sin nedmontering av stimulanser, från $85 miljarder till $75 miljarder. Om nu dessa 10 miljarder dollar i mindre stimulanser har satt igång Argentina, Turkiet, Syd Afrika och många fler länder inom EM hur skall det då se ut om vi får ytterligare neddragningar av ny tryckta pengar som sökt sig till högavkastande EM. Detta är förmodligen bara början på valutor som kommer att tappa snabbt i värde och räntor som kommer att höjas till mycket högre nivåer än vad vi har i dag. Högre räntor och högre matpriser är vad som kommer skapa mycket mer social oro i världen än vad vi har idag. Kyle Bass uppmanar till att man skall begära leverans av sitt guld. Vad händer med guldet hos JPM. Zerohedge skriver följande. On Friday, when we remarked on the biggest recorded withdrawal from the JPM gold vault, we said: "Something tells us the next few days will see matching withdrawals from JPM's gold vault, which at last check was officially owned by the Chinese." 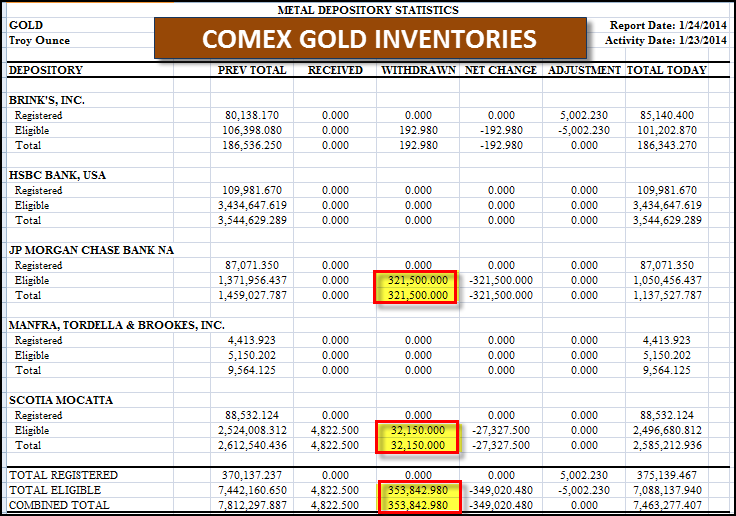 As it turns out we were absolutely correct: according to the just releasedupdate from Comex, on Monday the infamous gold vault located below 1 C(hina)MP saw an identical withdrawal of 321,500 ounces, matching the record withdrawal, and amounting to 28% of all JPM gold in storage. Adding to Friday's drop, this means that a record 47% of JPM's gold has been withdrawan in a few short days: a trend we are certain will continue until the total holdings of the vault drop to new record lows. This withdrawal means total JPM gold slides from 1.128 million ounces to 816,027 ounces, down from 1.459 million ounces a week ago. I am negative about U.S. stocks, and the Russell 2000 in particular. Regarding Abby's energy recommendation, this is one of the few sectors with insider buying. In other sectors, statistics show that company insiders are selling their shares like crazy, and companies are buying like crazy. I have no faith in paper money, period. 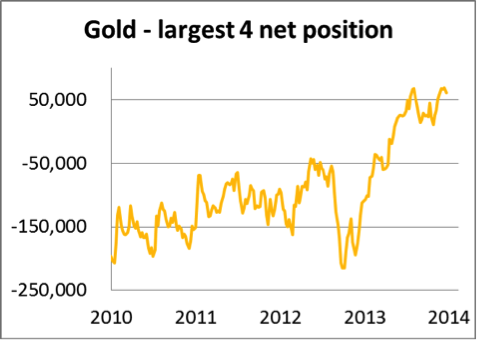 Next, insider buying is also high in gold shares. 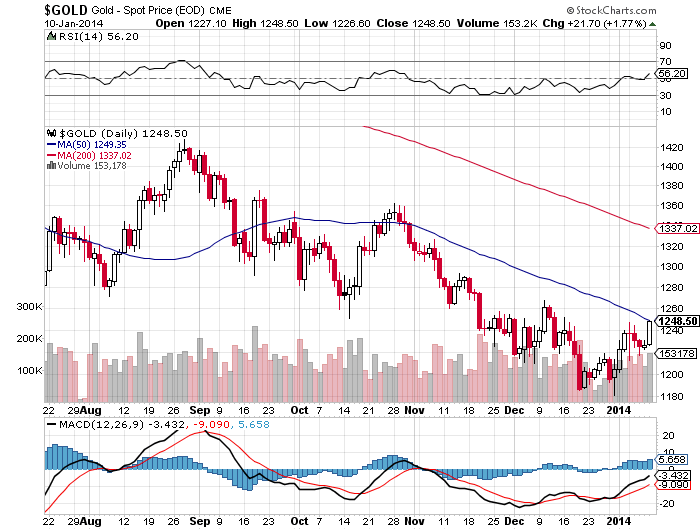 Gold has massively underperformed relative to the S&P 500 and the Russell 2000. Maybe the price will go down some from here, but individual investors and my fellow panelists and Barron's editors ought to own some gold.About 20% of my net worth is in gold. I don't even value it in my portfolio. What goes down, I don't value. Which stocks are you recommending? Faber: I recommend the Market Vectors Junior Gold Miners ETF [GDXJ], although I don't own it. I own physical gold because the old system will implode. 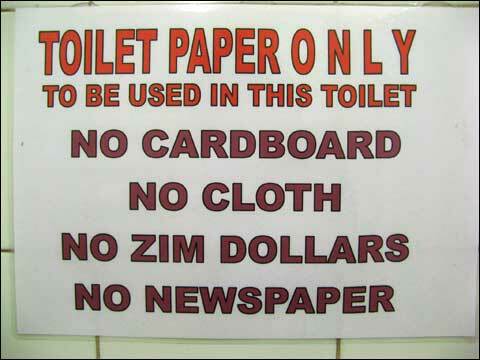 Those who own paper assets are doomed. Zulauf: Can you put the time frame on the implosion? Faber: Let's enjoy dinner tonight. Maybe it will happen tomorrow. I've owned gold for many years, I've never sold any gold and I can’t imagine I ever will sell gold in my life because it is somewhat of an insurance policy. I hope that my daughters own my gold someday, I mean I owned gold, I've never sold any gold and if gold comes down and I expect it to go down, doesn't mean it will, I’ll buy more. I’m certainly not going to sell. Everybody should own some precious metals as an insurance policy. So if they don’t have any right now, I would urge them to go buy something, buy themselves a gold coin if nothing else, and see that it’s not going to hurt. It won’t hurt you to buy the first gold coin, the first silver coin, and from that you start accumulating as your own situation dictates. 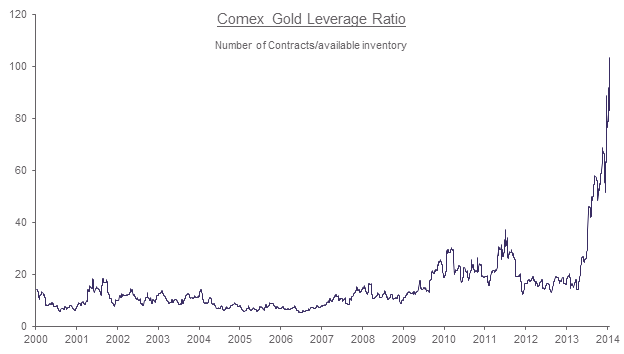 Don't look now but the physical gold shortage is growing. Everyone knows that JP Morgan is one of the biggest gold holders on the planet. They store gold for themselves and others. On Thursday JPM reported the single largest withdrawal in history at -321,500 ounces. Actually that was a tie with December 13th, 2012 when exactly 321,500 ounces were also withdrawn. Registered gold in JPM vaults has fallen to the lowest level in history at 87,000 ounces. 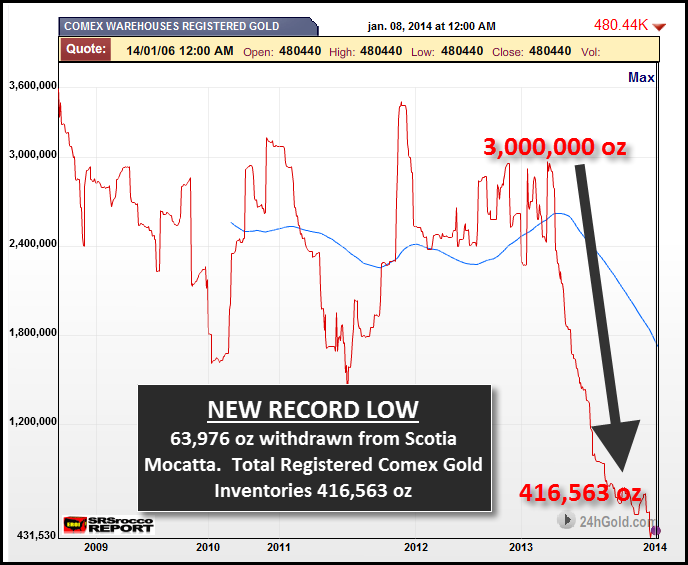 Registered gold at all Comex warehouses has hit a new low at 400,000 ounces. 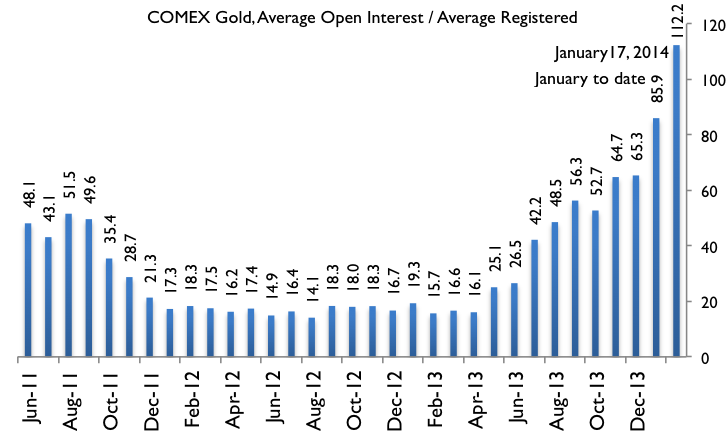 Comex claims there is a huge 92 owners per registered ounce today. Registered ounces are available for delivery to settle futures contracts. In other words the registered ounces are all that is backing up the existing futures contracts. Since the majority of futures contracts are never held until the delivery date there are tens of thousands more contracts then actual gold. If everyone suddenly began demanding delivery of the gold referenced by the futures contracts we would be in serious trouble. On January 17th there were roughly 500,000 registered ounces. At that time there were 111.6 owners per ounce. There are currently 41.309 million ounces being traded through futures contracts. This is "paper gold" not real gold. Where else but America could we be trading 41 million ounces of futures against 500,000 registered ounces? Obviously if only a fraction of the holders of those futures contracts began demanding delivery the price of gold would be much higher. We are currently seeing all time lows in registered gold and all time highs in claims against that gold. What is wrong with this picture? Bloomberg reports Austria has put its mint on a 24 hour schedule, trying to meet heavy demand for gold coins. The U.K. mint announced that it already run out of 2014 sovereign gold coins. There are tales of high demand at several other nations around the globe. Bernanke tar farväl och vad lämnar han bakom sig. Gold watchers are waiting for two announcements at the moment: the hour of reckoning when the Comex no longer has sufficient gold in its warehouses to cover deliveries; and a report from China that its official reserves are up from 1,054 as last reported five years ago to more than 5,000 tonnes. How anybody can be fooled by Goldman Sachs and Morgan Stanley into thinking that the next big move for gold will be back to $1,000 we don’t know. Did somebody not once say that if you are going to tell a lie make it a big one and people will believe you? What these US investment banks have done is to capitalize on investors’ myopia: they only see what is in front of them in US financial markets and don’t see the wood for the trees. Think US domestic short-term and you have a recovery on your hands and a runaway stock market. Still cashing out of gold after its big tumble last year and investing in the stock market that has just stalled after a stellar run looks like a suicide ticket to us. Perhaps the rise in the price of gold and silver since the beginning of the year is a sign that we are not alone in seeing this. Guldet går rakt upp när Argentinas peso rasar, det är vad som händer när valutan packar ihop vilket sker när man trycker för mycket nya pengar. Detta fenomen är vad som väntar resten av alla fiat valutor som finns runt om i världen. Förr eller senare tappar valutorna i värde och inflationen kommer som ett brev på posten. Samma sak gäller just nu i Turkiet där valutan är under fritt fall och dom som har varit förutseende har självklart bytt sina turkiska papperspengar mot guld eller silver. Today is options expiry for February on the Comex---and tomorrow is the last day for the large traders to roll out of their February futures contracts on the Comex as well---and by the end of trading on Thursday, every other trader holding a February Comex contract in any physical commodity must have either sold it, rolled it, or are standing for delivery on First Day Notice---and the first of those statistics will be posted on the CFTC's website late Thursday evening New York time. And, as always, it's who the issuers and stoppers are that matter. How big a part will the HSBC USA, Canada's Scotia Bank and, most importantly, JPMorgan Chase have in all of this? I'd guess that it will be almost all of it. It will be interesting to see how the delivery month unfolds. The above Comex timetable, along with the FOMC meeting that starts today---and ends tomorrow afternoon---will be what drives the market for the remainder of the week. It matters not that platinum production is shut down in South Africa, or that China is sucking the world dry of every gold bar it can lay its hands on. 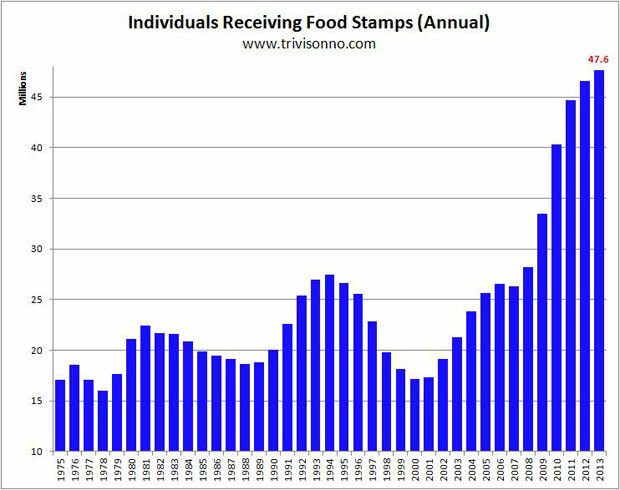 Supply and demand mean---and have always meant---nothing. 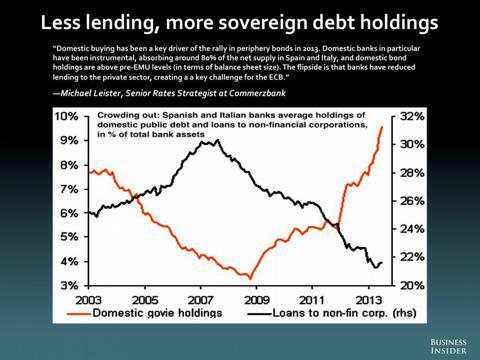 It's only what JPMorganet al do, or are instructed to do, that matters---period. Jewelry stores in Hong Kong have seen robust gold sales this month ahead of the Lunar New Year as prices fall. Miss Lu is a tourist from Guangzhou looking to buy a golden horse ornament worth about HK$20,000 in the shopping warrens of Causeway Bay in Hong Kong a few days before the Lunar New Year. "It will be a gift to my mother on the mainland," she said as the crowd swirled around her. "Gold is cheaper now. I bought a gold ring last week for myself." Jewelry stores saw robust gold sales in January, stoked by demand for gold horses before the Year of the Horse. Gold horses were getting a better welcome than the reception given to gold reptiles last year in the Year of the Snake, jewelers said. "Horses are regarded as the symbol of energy and health to the Chinese," said Lau Hak-bun, chief operations director at Chow Sang Sang. "People like to wear accessories or have golden ornaments of horses rather than snakes, which are lazy and evil in their view. "The jewelry store chain said it saw a 15 to 20 per cent increase in sales volume for January compared with last year. Saxat från Richard Russel, gudfadern när det gäller nyhetsbrev. I think China is intent on making its yuan the world's reserve currency. I think we will see a powerful gold-backed convertible yuan become the world's new reserve currency. I see China's Communist leaders literally begging its populace to accumulate gold. I see the Federal reserve intent on making its fiat currency the only accepted money, while gold, its competition, is scorned. Fed behöver trycka mycket mer pengar för att vända den nedåtgående trenden för velocity av pengar. Korta och långa perspektivet för guld. Valutaturbulens samtidigt stora uttag av guld från JPM. Under förra veckan var det någon/några som gjorde stora uttag av guld från JPM guld valv. Samtidigt har vi en valuta marknad som är i turbulens där emergin markets valutor som får se stora fall. Många länder inom EM har under lång tid fått se inflöden av nytryckta pengar som sökt hög avkastning. Nu när tryckpressen i USA börjar sakta in så vill alla göra samma sak samtidigt, nämligen lämna dessa högavkastande EM och därmed skapa turbulens på marknaderna. Möjligen vill någon ha fysiskt guld i stället för papperspengar nu när valuta marknaden är i gungning. 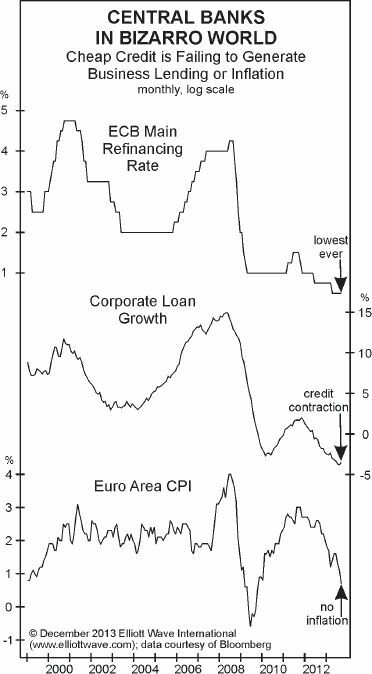 Ray Dalio om deflation och ekonomin m.m. Turkiets valuta är under stor press och man undrar var detta kommer att sluta. We have already discussed at length the supply and demand imbalance in an Open Letter to the World Gold Council, asking them to revise their methodology because it grossly understates the amount of demand coming from emerging markets. 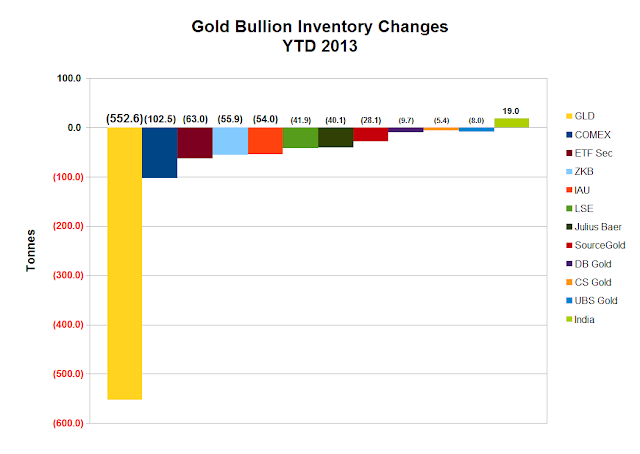 Our gold supply and demand table (Table 1) reflects the latest available data (2013 Q3 in most cases). World mine production, excluding Chinese and Russian production still stands at about 2,100 tonnes a year. Chinese net imports most likely exceeded 1,700 tonnes in 2013 (81% of world mine production) and demand from the rest of the world is rather stable. 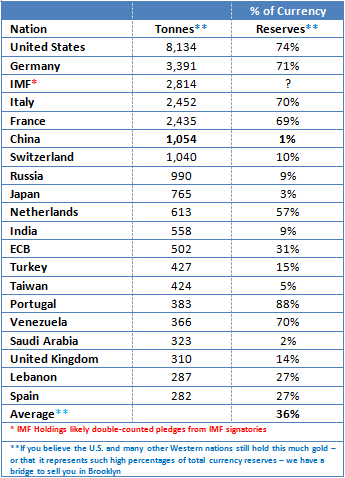 The overall picture has not changed much since our last article, with the exception of Indian imports. 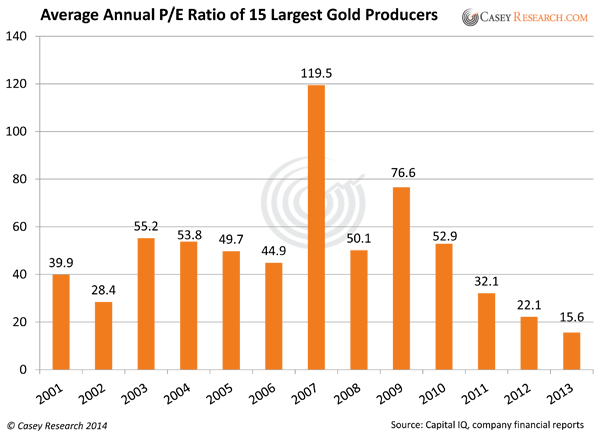 As of the second quarter of 2013, India had cumulative net gold imports of 551 tonnes, which annualizes to 1,102 tonnes. However, Q3 data shows net imports of only 31 tonnes (for a total of 582 tonnes YTD), which annualizes to 776 tonnes. But, without going into too many details, the classification of gold as a “good” in the trade balance is at best misleading. Since gold is more of an investment vehicle and is not “consumable” per se, it should instead be accounted for in the capital account of the balance of payments instead of the current account. Indeed, Switzerland, which is a large net importer of gold, reports its trade balance “without precious metals, precious stones and gems as well as art and antiques” to reflectfact that those are “investments” rather than consumption goods. In this case, why should India be any different and report their trade data excluding gold? To us, all the fuss about gold imports by the Indian Government is a red herring. Hur länge till kan företagen öka vinsterna genom mindre anställda och lägre löner. Vi har varit här förut. Är det dags för nästa resa utför. 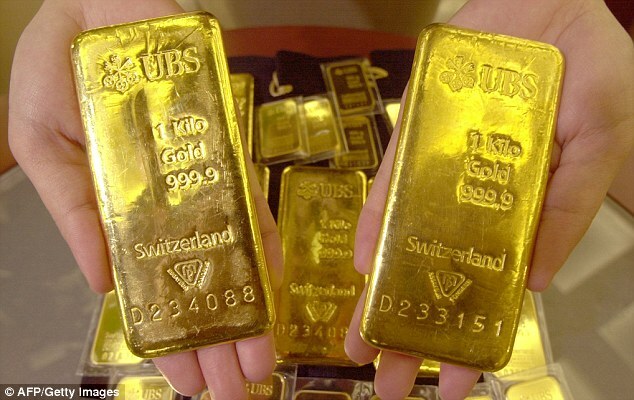 A year ago the Bundesbank announced  that it intended to repatriate 700 tons of Germany’s gold  from Paris and New York. Although a couple of jumbo jets could have managed the transatlantic removal, it made security sense to ship the load in smaller consignments. Just how small, and over how long, has only just become apparent. The paper gold in the London Bullion Market takes the familiar forms that bankers have turned into profit machines: futures, options, leveraged trades, collateralised obligations, ETFs . . . a storm of exotic instruments, each of which is carefully logged, cross-checked and audited. Or perhaps not. High-flying traders find such backroom work tedious, and prefer to let some drone do it, just as they did with those money-market instruments that fuelled the banking crisis. The drones will have full control of the paper trail, won’t they? There’s surely no chance that the Fed’s little delivery difficulty has anything to do with the cat’s-cradle of pledges based on the gold in its vaults ? John Hathaway suspects there is. He worries about all the paper (and pixels) linked to gold. He runs the Tocqueville gold fund (the clue is in the name) and doesn’t share the near-universal gloom of London’s gold analysts , who a year ago forecast an average $1700 for 2013. It is currently $1,260. As has been remarked here before, forecasting the price is for mugs and bugs. But one day the ties that bind this pixelated gold may break, with potentially catastrophic results. So if you fancy gold at today’s depressed price, learn from Buba and demand delivery. 79 ton levererat från SGE under vecka 2. It transpired last week that of the 43-odd tonnes per annum the Bundesbank expects to be returned from the New York Fed only 5 tonnes arrived in 2013. Furthermore, of the 373.7 tonnes stored with the Banque de France only 32 tonnes was delivered. This is little more than a morning's delivery in the London market, so it is hard to swallow the Bundesbank's excuses about logistics. The burning question is why is it so difficult to get its gold back? The most logical answer is that the Bundesbank's gold is long gone, but without hard evidence this can only be conjecture. One would have thought that the New York Fed would have at least come up with closer to 40 tonnes if only to stop the rumour mill running. There may be a risk that without clarification over the status of Germany's gold at the New York Fed other central banks using the Fed or even the Bank of England's storage facilities might decide to buy gold in the market, just in case. If that happens, bearing in mind that it is too early to think this is a real possibility, bullion prices could go much higher, given the lack of physical bullion available. Anyway, after a slow start to the week, with the gold price drifting back to find support at the 50-day moving average, gold began to go sharply better yesterday before the London morning fix. Soon there was a story circulating via Reuters that Sonia Ghandi has asked the Indian government to ease up on gold import restrictions. No doubt this has something to do with mid-year elections, and if so there is the prospect of the government relenting on gold import restrictions to appease the voters. 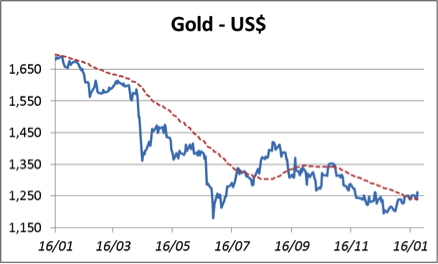 These stories no doubt contributed to a more positive tone for gold, which seems to be overcoming the confines of the 50-day moving average as shown in the chart below. 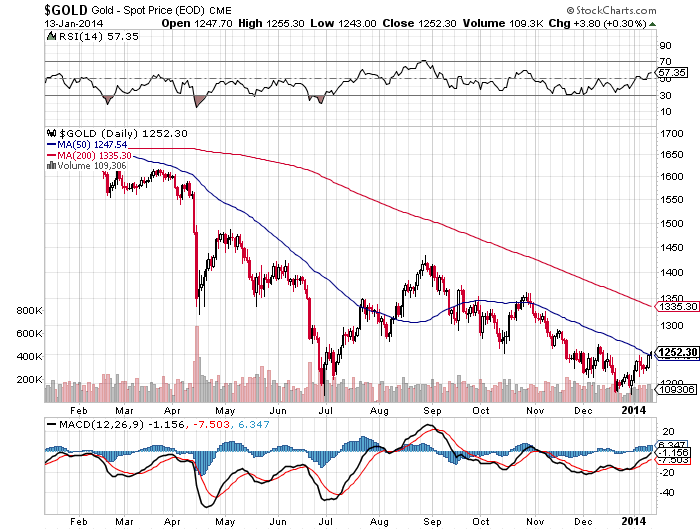 The 50-day moving average is losing downwards momentum, indicating the gold price may be on the turn. The relevance of this average is that short-term traders often use it for market timing. Therefore, if gold manages to move convincingly through apparent supply above the $1260 level, we can expect these traders to close their shorts and go long. The chart for silver is shown below. As with gold, silver is showing similar signs of bottoming out, as it tries to escape the confines of the $20-21 area and the 50-day moving average. 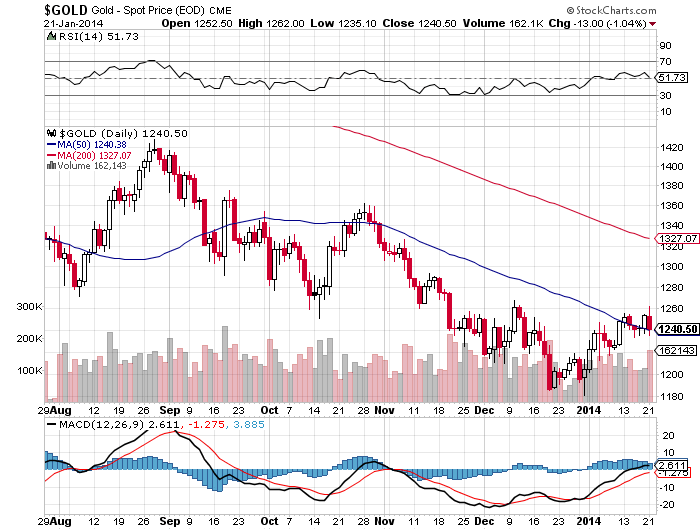 Gold gets explosive above 1270. Watch out. The Gold chart suggests that we should see further upside and a break of the upper trendline will support the forecast for further upside. We still need to see a little more action to confirm that the reversals are in play. Eric Sprott svarar på frågan om guldet har bottnat och vad som får det att gå upp. 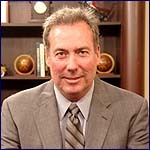 Eric Sprott: I think the lows are in here. The data on the supply side just couldn't be better in my mind. Imagine gold even hanging in there when you take the largest consumer in the world out of the market. came from central banks who are already on fumes in their inventory. silver, they cared about gold. Från Shanghai Daily. Kina har långt kvar till 10 000 ton guld. Intressanta svar från John Embry om guldbolagens värderingar. 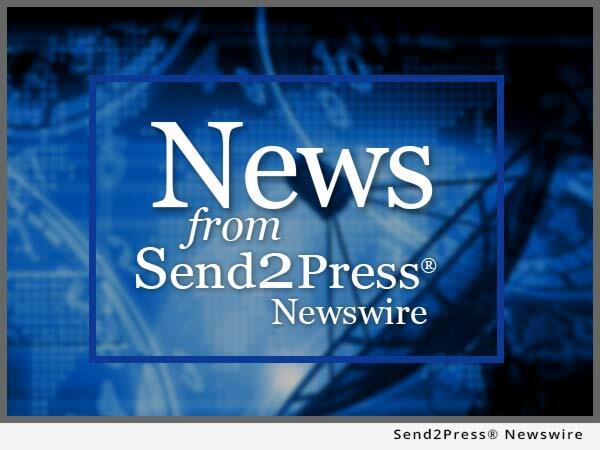 Do you think the mining stocks will be a good investment if gold recovers? I think, quite frankly, that this might be one of the great trades of all time. These stocks are so cheap now because at these gold and silver prices, nobody can make any money! If I'm right on the large magnitude move in the gold and silver price, it will lead to a tremendous flow of money into this sector because these companies will start making a lot more money. The sector has shrunk to such a small market cap—because of the current bear market—that when the money does come I think it will be outsized. These stocks have fallen so far, and people are so negative on them, that a change in sentiment could drive these prices upwards very quickly. 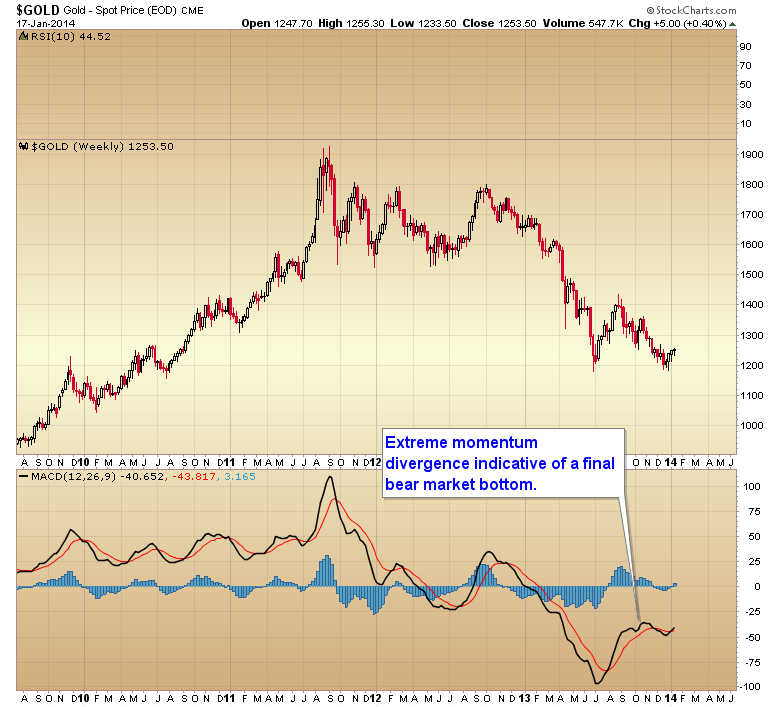 Are you concerned that the price of gold could fall even further within, say, the next 12 months? Well, that seems to be the "buzz" out there. That's what the media are saying. Honestly, I was surprised that the price had fallen this far, so I will not exclude that possibility. Ryssarna fortsätter att öka sin guldreserv, 79,5 ton under 2013. Vem skall finansiera USAs underskott med mindre slantar från FED och utlandet. Hur skall börsen kunna gå upp med mindre pengar från FED. Insiders kliver av börsen. Frågan är vad dom vet som ingen annan vet. Har vi fått en dubbelbotten. Den monetära basen minskar vilket innebär att det blir svårt för FED att minska tryckningen av nya dollar. The US monetary inflation rate continues its downward drift. As at the end of December the year-over-year (YOY) rate of growth in US True Money Supply (TMS) was 7.2%, its lowest level since November of 2008. Refer to the following chart for details. Vad har Bernanke uträttat under sina år som ordförande för FED. Bernanke’s real legacy produced the following outcomes. The always-reliable ZeroHedge site states some undeniable facts under Bernanke’s watch. The US has never experienced 3% GDP growth. The labor participation rate has fallen to levels not seen since the ‘70s. 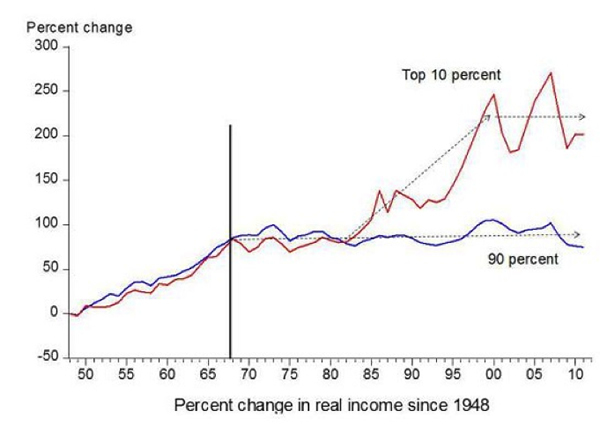 Inflation-adjusted median incomes have fallen 7%. The US’s debt load has risen from $8.4 trillion to over $16 trillion. The Fed’s balance sheet has increased from $800 billion to over $4 trillion (larger than the economies of Brazil, France and even Germany). Food prices have hit record highs fomenting revolutions in the Middle East and untold suffering around the globe. The Fed has funneled trillions of Dollars into both US banks and European banks. The Fed has allowed fraud, insider trading, and corruption. Nästa vecka tackar Bernanke för sig. The SPDR [GLD] gold ETF and the Gold Trust gold ETF have their respective holdings at 797.054 tonnes and 161.37 tonnes respectively. The shock purchase of 7.498 tonnes on Friday has alerted the U.S. market to the possibility that the gold investment climate there could be changing from winter to summer. But springtime takes longer than a day. Fortfarande rekordhögt förtroende för fortsatt uppgång på börsen. For another week the bears were little changed at 15.1% after edging higher last time to 15.3%. The differences were only due to changing totals, not opinion shifts. Late December their number fell to a 26-year low ago at 14.1%. A lower bearish level was last shown on 20-March-1987 at 13.6%. The bears say the market advance without any notable correction means conditions are ripe for a major tumble. Once the decline gets underway they expect it to quickly accelerate to the downside. However they have little technical evidence to offer in support. Again the changes were between the bulls and correction, with the latter contracting slightly to 27.3%, from 28.6% a week ago. Last fall the reading was well above 30% but the market weakness through mid-December was enough for them to shift back to bullish to avoid missing the year-end rally. Their latest decrease occurs with some new index highs and if they expand, we could again see their number grow. 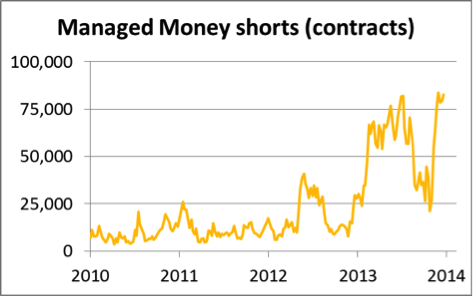 The spread between the bulls and bears expanded to 42.5%, after narrowing to 40.8% last issue. 2013 ended with the difference at 46.4% for another record extreme. The data has been negative territory for more than three months, pointing to increased risk. The spread was 42.4% in October 2007. In contrast August 2013 ended with the spread at 13.4%, close to the 10% (or less) reading that allows for buying. The bears haven't outnumbered the bulls (negative spread) since October 2011, after the correction from highs that April. 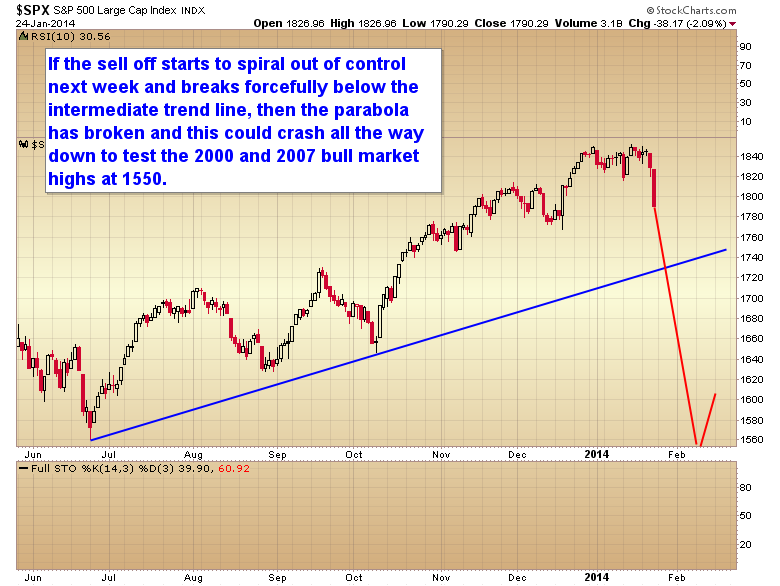 Viewed another way in this week's chart the bears are now more than 25% of the bulls. That said, both inflationists and deflationists agree that a financial collapse is coming. The inflationist argues that fiat currencies by necessity will be “printed” (digitally created) with such speed that we hyper inflate and devalue the currencies to virtually zero. The deflationists say that the debt will default faster than the central banks can print new money and thus the money supplies will shrink and hyper deflation (like the 1930′s) will result. True inflationists believe that gold will explode in fiat price (and purchasing power) while the deflationists disagree and believe the “price” of gold will plummet versus the dollar. My opinion is that both of these camps are correct, and both of these camps are incorrect…however, only one can be correct regarding the purchasing power of gold. Let me explain why I believe both camps to be correct at the same time. Yes debt (and derivatives) will blow up so quickly that the central banks will not be able to supply new money fast enough and yes the central banks will “try” by “printing.” …But, currencies today are debt based meaning they have value that is derived or “foundationed” by debt. If debt is collapsing it then follows anything that has value based on this debt will also collapse. Gold is a different animal, as JP Morgan once testified to Congress, “Gold is money and everything else is credit.” Gold has value because it “is,” it has inherent value while no other currency on the planet does. Pekar kurvorna åt rätt håll med en ekonomi som går åt rätt håll. Guldet kämpar vid 50 dagars, när bryter vi igenom????? Comex hur skall detta sluta. Kina köper allt guld dom får tag på ändå går guldet ner. UK farmland fortsätter upp, guldet går ned. Guldet har mycket att ta igen när manipulationen upphör. Allting är på topp. Vart skall vi härifrån? Guldet vid mycket kritiskt läge. Lyssna på William Black om JPM och USAs ekonomi. FED klart största köpare, svårt att se minskade stimulanser utan mycket högre ränta. Var skall tillväxten komma ifrån??????? Guldlagren hos Comex är rekordlåga. Det är nu ca 112 anspråk på varje oz guld som finns i lager. Februari är en månad då det normalt görs stora uttag från Comex lagren. Blir det lika i år så kommer det att bli knepigt, det finns bara ca 11 ton och förra året tog man ut i februari ca 40 ton. Möjligt att vi närmar oss slutet för Comex och deras pappershandel av guld. FED minskar stimulanserna trots få positiva signaler. Efterfrågan på guld i Kina stiger exponentiellt. Kan det bli lägre förtroende för silvret. Efterfrågan rekorhögt men priset rekord lågt. Coin demand has seemingly taken the mints of the world by surprise. Last week we were greeted with the news that the UK Royal Mint was experiencing shortages, this week it is the US Mint who is having supply problems. They have cautioned buyers that the allocation for 2014 American Silver Eagles will be sharply lower next week. King World News note: It is quite astonishing that you can see in the chart above (figure 52) the adjusted market cap per ounce of gold resource divided by the gold price is back to levels last seen in the 1990 time frame, which was directly in the middle of the roughly 20 year bear market in the price of gold. Gold is simply experiencing a mid-cycle correction in a secular bull market, and yet the devastation in the mining shares has reached historic extremes on the downside. This is why people like John Hathaway, John Embry, Egon von Greyerz, Rick Rule and Eric Sprott talk about the unbelievable opportunity this market represents for patient, long-term investors. Each round of money printing eventually feeds back into the price system, creating demand for another round of money printing ... and another ... and another, with each successive increase larger than the previous one, as is the nature of foolishly trying to restore money’s purchasing power with even more money. The law of diminishing marginal utility applies to money as it does to all goods and services. 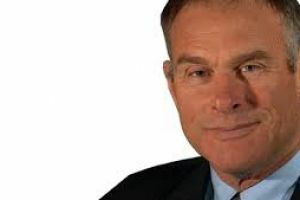 The political and social pressure to print more money to prevent a loss of purchasing power by the politically connected and government workers will be seen as absolutely necessary, proper, patriotic, and ethical. Är 2014 året då räntan och dollarn bryter ur sin megafon. Mike Maloney om skatten inflation. Viktigaste chartet enligt Albert Edwards. I do believe this to be utter nonsense. For in the same way as investors believe, axiomatically that QE will drive up equity prices, they believed exactly the same thing of commodities until 2012. Commodities are a risk asset and benefited massively from QE1 and QE2, so why has QE3 had absolutely no effect on commodity prices? Exactly the same thing could happen to equities if a recession unfolds and profits plunge at the same time as the printing presses are running full pelt. Do not assume equities MUST benefit from QE. Lyssna på Egon Von Greyerz om guld och ekonomin 2014. Faber said the good times cannot last. "The economic recovery, or so-called recovery, by June of next year, will be in the fifth year of the recovery," Faber said. "So at some stage the economy will weaken again, and at that point, the Fed will argue, 'Well, we haven't done enough, we have to do more.'" The noted bear has little admiration for the economists at the Federal Reserve. 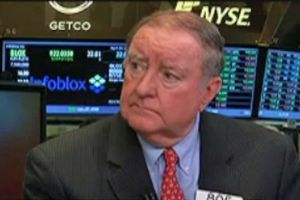 "The Federal Reserve—all of them—could be sitting on a barrel of dynamite, and then pouring gasoline on top of it, and then light a cigar with matches, throw the match into the gasoline, and then not notice that there is any danger," Faber said. "That is the state of mind of the professors at the Fed, who never worked a single [day] in business." And while Faber actually believes that a reduction in QE could happen, he wouldn't view it as a true tapering, as he says it will be a largely meaningless, one-time move that will eventually be reversed as the economy worsens. "They may do some cosmetic adjustments, but in my view, within a few years, the asset purchases will be substantially higher than they are today," Faber said. The Fed stopped the yield on the 10-year T-note from rising above 3% in September, but I don’t think the central planners and market interventionists at the Fed can stop what now looks like a locomotive building up a head of steam. The long-term trend that had been leading to lower yields changed back in May. Investors are selling long-term paper. The writing is on the wall, and it says higher inflation is coming. It seems pretty likely that rising interest rates are going to rip through the economy and global financial markets like a tsunami with damaging consequences. 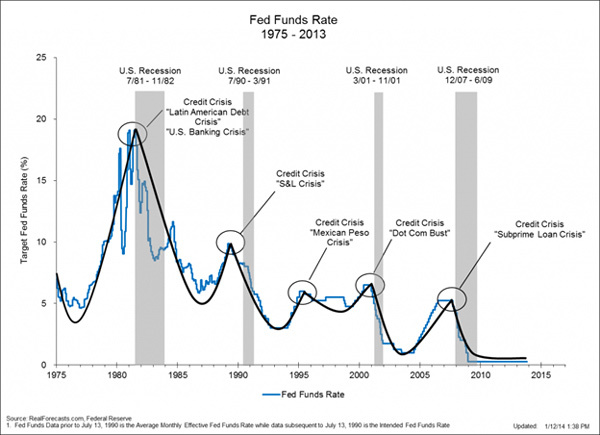 Rising interest rates could well be the most important factor impacting domestic as well global markets in 2014. The other major disruptive force in 2014 is probably going to come from Japan. The so-called Abenomics program, named after its prime minister, is failing. Inflation is rising in Japan, but wages and economic activity are not benefiting from the Bank of Japan’s money printing. Earlier today Bloomberg reported that consumer prices in Japan are rising 5-times faster than wages. Japanese consumers are being squeezed, just like what is happening to US consumers and indeed, most countries today. Guldets andel av USAs totala finansiella tillgångar. Det är fortfarande negativa räntor i USA vilket är positivt för guldet. Är USA på rätt väg???????? Sentiment lägsta nånsin för guldet men man säljer allt man har. När man ser ovanstående chart så är det svårt att förstå varför USA skall styra guldpriset genom pappersmarknaden som är ca 100 gånger större än den fysiska marknaden. Comex har nästan inget guld kvar i sitt lager och när det spricker så kommer vi förmodligen få se en värld där efterfrågan på fysiskt guld sätter priset på guldet. Då är det ett pris betydligt högre än dagens manipulerade pris med hjälp av future marknaden. Kineserna vet detta och köper allt guld dom kan få tag på. Sentiment för guldaktier rekordlågt och för cykliska rekordhögt. Sentiment för guldaktier har aldrig varit lägre än nu. För cykliska aktier är det däremot så att alla är optimistiska. Om alla är positiva vem skall då köpa och om alla är negativa vem skall då sälja. Bra köpläge i guldaktier och bra säljläge i cykliska aktier. Värderingen för guldaktier har inte varit så här lågt på mer än 12 år. Silver sentiment är på rekord låga nivåer samtidigt som efterfrågan på silver coins är på rekord höga nivåer. Något stämmer inte. Vi vet att JP Morgan är korta silver, och det är med mycket, mycket kontrakt. Frågan är hur länge dom kan hålla tillbaka och rigga silver marknaden. Dom är nu långa guld marknaden för att kompensera sitt korta innehav i silver. Än dag släpper dom allt och låter marknaden sätta pris. Guldet har det jobbigt att bryta igenom 50 dagars, det finns många som har stora korta positioner och självklart vill man inte se att guldet går igenom 50 dagars och därmed formaterar en bullish formation. Etablering över 1260 kan vara det som behövs för att korta positioner måste täckas och vi därmed får en kraftigt ökad efterfrågan på future marknaden. Får Tyskland tillbaka sitt Guld. It really depends on the battle between deflation and inflation. Ultimately I see gold much higher, as you know Lelde, I see it at $US7,000 or $US9,000 an ounce, possibly higher – Based on fundamentals and based on loss of confidence in the existing international monetary system. 1 687 000 färre arbetar i USA än vid ingången till förra finans krisen. Färre jobbar i USA och vem skall dra in till statens utgifter. James Turk ser botten för guldet. Goldman nedgraderar börsen ser möjligt dropp om ca 10%. 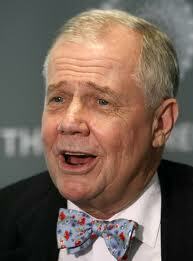 Jim Rogers om den kommande ekonomiska kollapsen. Har vi sett botten på silvret. Finansiella marknaderna blir bara större och större. Nu nästan 4 ggr ekonomin i USA. Megafonen är nu fullbordad för Dow Jones, är det dags för nästa ben nedåt. Lyssna på Stockman när han berättar för King att alla marknader är riggade. Undra om det finns någon marknad med så mycket korta positioner som i guld. Rick Rule menar att dom som är korta silver kommer att ångra sig. Guld och olja brukar följas åt och med dagens oljepris får man ca 12 fat med olja för en oz guld. 2002 när guldet började sina långa oavbrutna uppgång på 10 år var samma relation 13 fat för en oz guld. Priset är således billigare idag än innan den långa uppgången började. Skulle vi ha samma relation som 1998, 24 fat för en oz, då skulle vi ha dubbla guldpriset. Vi borde ha prickat botten för guldpriset och nu är nog bara frågan när vi tar fart uppåt. Plundringen av guld fonderna måste sluta. Hur länge till kan marknaden plundra GLD fonden på guld och därmed pressa marknaden till dessa låga nivåer. Under 2013 var det ca 550 ton guld som lämnade fonden och förmodligen skickades till Asien och hamnade i mycket långa händer. Det tog fonden åtta år för att bygga upp sitt innehav och på ett år försvann 40% av fondens innehav. När dom som har GLD innehav slutar att sälja så kommer det också att innebära att dom stora bankerna inte kan plundra dessa på guld och därmed får vi ett scenario med mycket stort underskott i utbudet av fysiskt guld. USAs underskott i handelsbalansen har gjort det möjligt att finansiera landets eviga underskott i budgeten. 2010 var handelsbalansunderskottet $498 miljarder och utlandet ökade sina innehav av statsobligationer med $456 miljarder. 2012 var underskottet $540 miljarder och utlandet ökade sina innehav med $386 miljarder. För 2013 är uppskattningen att underskottet blir ca $485 miljarder och obligationsköpen mindre än $30 miljarder. Trenden är helt klart att det blir mindre andel utländskt kapital som kommer att vara med och finansiera dom väldiga underkotten som USA har och kommer att ha under lång tid. Det finns bara två vägar att lösa detta. Räntan måste gå upp för att attrahera inhemskt kapital eller att FED trycker mer pengar och håller räntan nere. Många tror att räntan har gått upp för att ekonomin har blivit bättre vilket nedanstående chart visar är helt fel. Det beror till största delen på att utlandet har nästan helt slutat att öka sina köp av USAs obligationer vilket medfört att räntan har gått upp och FED kommer att behöva trycka ton vis med nya dollar under lång tid. Optimismen för SP-500 är på rekordnivåer. Lyssna på Dr Paul Craig Roberts om när det inte finns guld att köpa. Vad händer 2014 med guldet. Grant Williams anser att det kan bli jobbigt för dom som är korta guldet. 20 länder som producerar mest silver under 2012. Spekulanterna har inte varit så här bearish för guldpriset på mycket lång tid. Idag har vi ett silverpris som är alldeles för lågt i förhållande till värderingen för SP-500. 2011 när priset för silver var runt $50 hade vi ett för högt silverpris i förhållande till aktier. Således är det dags att sälja SP-500 och köpa silver. Senaste siffran för inflationen inom EU är nu nere på nivåer som måste göra ECB oroliga för att Europa skall hamna i en liknande deflations ekonomi som Japan varit i de senaste 20 åren. Kärninflationen visade sig vara 0,7% vilket är långt under ECBs mål och kommer med all säkerhet medföra att ECB måste sänka räntan ytterligare och dessutom stimulera ekonomin med nya pengar. Bankernas utlåningen inom EU minskar och för att kompensera så måste ECB trycka nya pengar. Frågan är hur Tyskland ställer sig till detta nu när Euron blivit dyrare mot världens valutor. Helt klart är att deflation är ECBs värsta fiende och de kommer att göra allt för att inte hamna i deflations fällan. Hur bra är analytikerna på att spå silver priset. Inför 2013 hade analytikerna en bedömning om ett silverpris i intervallet $30-$40 och vi slutade året runt $20. Inför 2014 har samma analytiker en bedömning om ett pris i intervallet $20-$26 vilket då borde indikera att priset kommer att vara i intervallet $30.$40. Kinesernas efterfrågan på guld är rekord högt i början på 2014. Guld enligt en French curve. IMF varnar för nedskrivningar av lån och en skatt på sparat kapital. IMF har sin senaste skrivelse bekräftat att eftersom skulderna för de utvecklade ländernas regeringar är de högsta på 200 år så skall de med förmögenheter vara med och betala av skulderna. Det pågår "financial repression (En term som beskriver åtgärder genom vilka regeringarna kanalisera medel till sig själva som en form av skuldavskrivning.Begreppet infördes 1973 av Stanford ekonomer Edward S. Shaw och Ronald I. McKinnon. Finansiell repression kan innefatta sådana åtgärder som riktas utlåning till regeringen, lock på räntor, reglering av kapitalrörelser mellan länder och en tätare koppling mellan regeringen och bankerna.) som tillsammans med behövligt högre inflation kommer att medföra den största förmögenhets förflyttningen någonsin. Från fotfolket till bankerna och regeringarna. IMF kommer se till att det blir beskattning av förmögenheter och kapital kontroll inom vissa länder. Bail In som recept för att rädda bankerna kommer att bli mycket kostsamt för individer och företag med pengar på banken. Försäljningen av guld coins stiger igen. Lyssna på David Morgan om att silvret noteras under produktions kostnad. James Turk hävdar att guldet skall tillbaka och följa FEDs ökning av balansräkningen. Miljardärer säljer aktier i USA. Buffet dumpar konsument aktier. Blir 2014 året då vi får se USD index notera 70. Ser ut som guld och silver aktierna har bottnat ur. XAU noterade guld gruvbolag har inte gått ner mer än tre år i rad under de senaste 30 åren. Kampen mellan inflation och deflation pågår. Utlåningen minskar i EU samtidigt som bankerna köper mera av sitt lands skulder. Deflation på gång i EU, ECB behöver stimulera. Ser vi framför oss samma ränteuppgång som på 60-70 talet. Hedge fonderna är rekord korta i Guldet, insiders är rekord långa. Kina medvetna om att USA pressar guld priset. 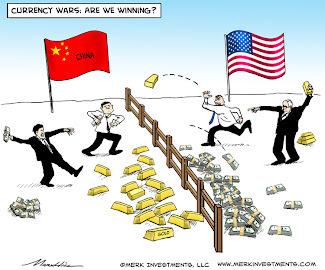 Gold price suppression is U.S. government policy to maintain the dominance of the U.S. dollar in the ongoing international currency war, the president of China's gold mining association, Sun Zhaoxue, told a financial conference in Shanghai last June. Sun's remarks were disclosed today by gold researcher and GATA consultant Koos Jansen, who obtained them from a rough transcription provided by the SINA Financial news service. Jansen prefaces Sun's remarks with some incisive observations of his own about whether there is manipulation of the gold market and, if so, who is responsible for it. Jansen describes himself as a believer in "conspiracy facts," since, he writes, when money and power are at stake, people conspire. Andelen av utlåningen som är klassat med mycket hög risk är nu dubbelt så hög som innan förra finansiella krisen. 45% av utlåningen är krediter med mycket dålig säkerhet och med tanke på vad som hände 2008 så kommer det inte bli någon trevlig utveckling när vi går in i nästa nedgång i ekonomin. IMF går ut med en skrivelse där man varnar för den extremt höga skulden som finns runt om i världen. Den högsta på 200 år och det kommer att krävas nedskrivningar av lån och andra åtgärder för att få ordning på skuldsidan. Problemet är att skulderna har blivit så stora att det är svårt att se någon vändning utan att det kommer att bli mycket stora störningar i dagens ekonomiska system. Att inflatera bort skulderna är det mest troliga, vilket man gjort förr. Problemet är att få inflation och sedan kunna kontrollera så den inte blir för hög. IMF medger att vi har stora problem i världen och att det inte kommer att bli lätt att få någon ordning på detta skuldberg som växt till sig sedan papperspengarna började flöda 1971. Är 2014 året för Guld??????? Guld och olja brukar följas åt. Sedan guldet lämnades utanför det monetära systemet 1971 har oljan och guldet följts åt. Det senaste årets nedgång har dock inneburit att ration har kommit ner mot samma nivåer som för 10 år sedan då guldet började sin senaste uppgång. Skulle vi ha samma ratio som på 70-talet, 16 x oljepriset fick vi ett pris på ca 1750 USD. The ETF was raided in H1/13, and I think the World Gold Council should wonder why. I believe it is because there was no gold. The plan was to slam the gold price down, get everyone to liquidate their SPDR Gold Shares ETF (NYSEARCA:GLD) shares, then buy the shares, redeem them for gold and deliver the gold out to the counterparties that are demanding it. The whole thing was a setup because of the shortage of gold. Guld och Silver mest översålda någonsin. Är plundringen av guldlagren över???????? ?